Cabbage is synonymous with detoxification and weight balance because it cleanses your liver and fills you up for only 17 calories a cup! 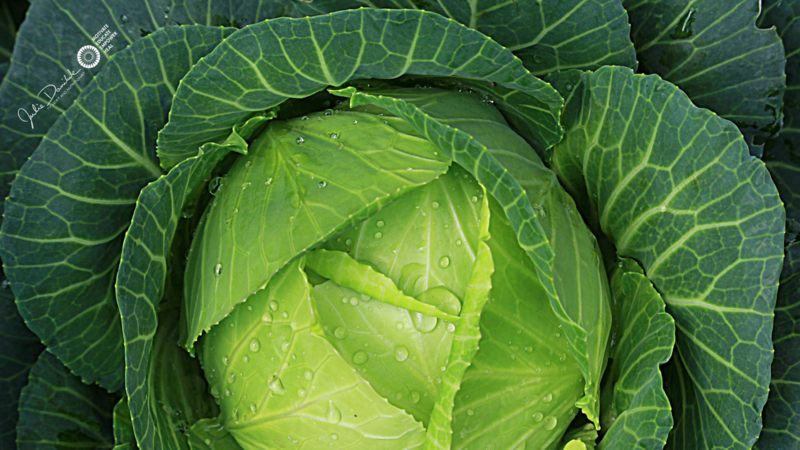 Add lots of cabbage to your healthy Live-It & benefit from an ongoing cleanse... and more! 1. Cabbage juice can be a miracle healer for your GI tract. 2. Cabbage can fight breast cancer. 3. Cabbage is an excellent source of Vitamin K.
Cabbage has high levels of polyphenols – a large group of molecules recognized for their antioxidant power. One of the great things polyphenols do is protect your body from oxidative damage, especially your skin.5 Researchers show that with a diet high in polyphenols you'll experience less damage from UV rays than with poor polyphenols intake. 5. Cabbage contains essential fatty acids. Cabbage has a surprisingly good content of essential fatty acids (EFAs), especially alpha-linolenic acid (ALA, a type of Omega-3).6 EFAs are more needed with inflammatory conditions – research shows that EFAs significantly improve inflammation in cystic fibrosis. Please Note : If you have a thyroid condition, speak to your doctor before consuming cruciferous vegetables. For more information on thyroid function, click here. Kidd PM1: “Vitamins D and K as pleiotropic nutrients: clinical importance to the skeletal and cardiovascular systems and preliminary evidence for synergy.” Altern Med Rev. 2010 Sep;15(3):199-222.